At Great Yarns we truly appreciate the finer fibers in life! We know you dedicate a lot of time making your knit and crochet creations and we want to offer you the best fibers to help make your projects really stand out in the crowd. With so many options of fiber, texture, and color you are sure to find something here that gets your creative juices flowing! After all, Great Yarns make Great Knits! All day giveaways and refreshments! Come join the party! Join us and the area's local yarn stores in the celebration of the year! This event is so much fun! The 24 member shops will each be offering a free crochet pattern, a free knitting pattern, and a free souvenir pin! Each shop will also be holding a daily prize drawing for a Bag o’Goodies – the 2018 daily prize bags were each valued at $150 USD or more. Get your passport stamped at 8 shops and enter a drawing for a $100 gift certificate to one member shop. Get your passport stamped at 16 shops and enter a drawing for a $200 gift certificate to a member shop. And the GRAND PRIZE: get your passport stamped at all 24 member shops and enter a drawing for a $500 gift certificate that can be split among up to three of our member shops! Be sure to pick up your store passports, tote bags, and pouches at our shop available beginning April 16th. For more details visit the site at lystour.com You don't want to miss out on the fun! Watch here to find out where you can visit us around the country at amazing yarn shows! We are always updating our sale section with discounted and hard to find closeout yarns at fantastic prices! Be sure to check it often so you can take advantage of the great prices before the inventory is gone! Please note all sale and clearance purchases are final, no returns are available. All non-sale items are able to be returned within 60 days. Check out the next great cruise we are planning and click on the this link www.cruisinglady.com or contact Mara via phone or email for more info on booking. 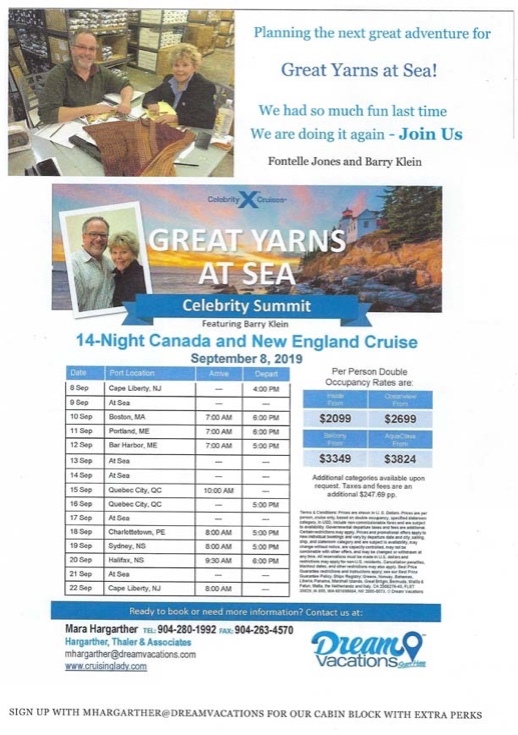 Also visit www.greatyarnsatsea.com for more information! We'd love to have you join us! To see a slideshow of the interior of the beautiful cruise ship click here! Contact Mara at 904-280-1992 or mhargarther@dreamvacations.com or visit www.cruisinglady.com for more information and to register now before space fills up on this fantastic adventure! CHECK OUT ALL THE NEW CLASSES WE ADDED! Check out the link on the left and sign up for some fantastic classes that are newly listed! There are SO many new knit and crochet classes that have been added! Come learn something new or brush up on your skills. NEW CHIAOGOO TWIST MINI INTERCHANGEABLE KIT IS HERE! This kit is an amazing game changer for those who love knitting with needles sizes ooo - 1.5! CLICK HERE to buy yours now! On the 1st and 3rd Wednesday of every month we will keep the shop open until 8:00 pm and invite you to come, sit, knit or crochet, and relax with us. It is always a fun time for all of us and as a cool bonus any purchases made while enjoying Knit Night are 10% off! Bring a snack to share and come find out what all the excitement is about! DON'T MISS OUR NEW "PATTERNS" CATEGORY! Click on it and see all the patterns we are adding daily! All are available for shipping as hard copies but very soon you will have the ability to download an electronic copy!